After the Fires | Kid Reporters' Notebook | Scholastic Inc. 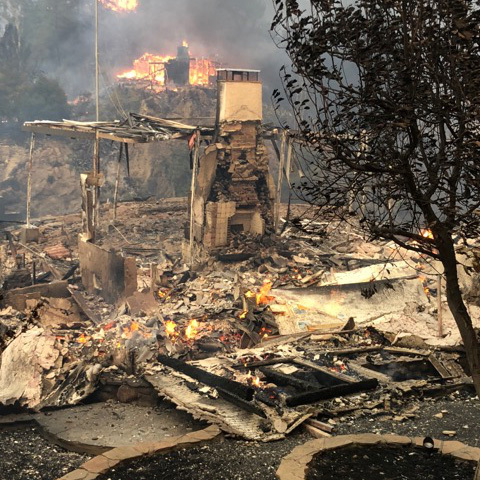 The Woolsey Fire caused extensive damage in Jaxon’s neighborhood in Southern California. “Wake up, Jaxon. We have to leave right now.” That was all I heard my mother say. It was 2:30 in the morning, and we had just been issued an evacuation order from the fire department. A massive wildfire was approaching our house. We jumped into our car and drove away as quickly as we could. Hours later, on what was supposed to be a typical school day, I learned that our house in Malibou Lake, California, had been reduced to rubble. Many other houses in the neighborhood were either damaged or destroyed. The fire had started on November 8 in the Woolsey Canyon north of Los Angeles. It raced through the canyons of Los Angeles and Ventura counties, reaching my neighborhood a day later. Over the course of two weeks, the Woolsey Fire burned nearly 97,000 acres. More than 295,000 people had to be evacuated, and three people were killed. The fire was one of several that began in California in early November. The Camp Fire in Butte County claimed the lives of at least 86 people. It was the deadliest and most destructive fire in the state’s history. Rock art near Jaxon’s home in Malibou Lake shows his handprints from 2013. Firefighters and other first responders struggled to get the fires under control and bring people to safety. Members of FEMA (Federal Emergency Management Agency), as well as state and local officials, gave financial and logistical support. Meanwhile, the Red Cross and other volunteer organizations assisted people who had been displaced. My family was lucky to find another place to stay. We were also fortunate to have the support of my school and our community. One thing that I will never forget is the generosity of my classmates and teachers. When my friends at school heard that all of our Christmas ornaments had been lost in the fire, everyone made an ornament for us or picked one from their own tree. I had always loved our Christmas tree and looked forward to decorating it. Each ornament held a story or memory. Still, this year’s tree was our best yet. The new ornaments from my classmates are now family treasures and represent the real meaning of the holiday season. The Woolsey Fire destroyed more than 1,600 homes, including Jaxon’s. I learned that although adversity can be challenging, it also can bring out the best in people. I will carry that spirit with me as we start the long process of rebuilding.